NCDC Notification is out. 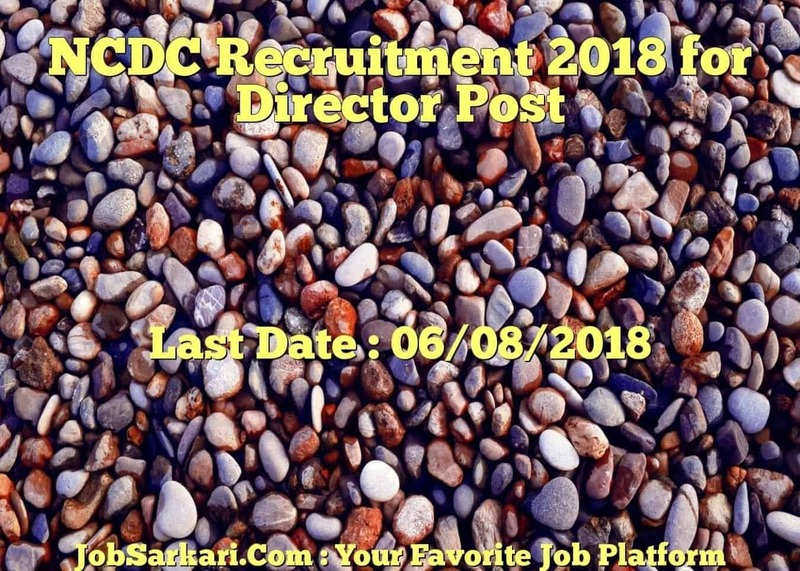 NCDC is recruiting for 70 Director Post Posts. You can check NCDC - National Cooperative Development Corporation last date, download NCDC notification, visit NCDC official website and check other NCDC Vacancy details.Complete Vacancy and recruitment Details about 70 Director Post vacancies in NCDC are provided below by JobSarkari.Com only for you. Last Date for Apply Online 06/08/2018. For Deputy Director Post Rs.1200/-. For All Other Posts Rs.750/-. Deputy Director (Finance) Candidate Must Have Passed Graduation With MBA With Specialization in Finance or PG in Commerce or CA / ICWA With 05 Years Experience. 35 Years. 01. Deputy Director (General) Candidate Must Have Passed Graduation With MBA With Specialization in Finance / Marketing or PG in Economics / Commerce / Statistics / Agricultural / Rural Management / Cooperative Management / Banking / Insurance or CA / ICWA With 05 Years Experience. 35 Years. 02. Assistant Director (General) Candidate Must Have Passed Graduation With MBA With Specialization in Finance / Marketing or PG in Economics / Commerce / Statistics / Agri-Business / Rural Management / Cooperative Management / Banking / Insurance or CA / ICWA With 02 Years Experience. 30 Years. 05. Assistant Director (Finance) Candidate Must Have Passed Graduation With MBA With Specialization in Finance or PG in Commerce or CA / ICWA With 02 Years Experience. 30 Years. 03. Assistant Director (Textile) Candidate Must Have Passed B.E. / B.Tech in Textile Engineering With 02 Years Experience. 30 Years. 01.
sugar mill and conversant with use of computer and related software With Two years Experience. 30 Years. 01.
documentation, mortgages, guarantees, hypothecation, recovery suits. 30 Years. 01. Programme Officer (General) Candidate Must Have Passed Graduation With 50% Marks (45% for SC / ST) And Two Years of Experience Working in Any Government Body. 30 Years. 05.
terminology work in Hindi and/or translation work from English to Hindi and vice-versa. 30 Years. 03. Senior Assistant (General) Candidate Must Have Passed Graduation With 50% Marks (45% for SC / ST) And having Knowledge of Computers. 30 Years. 26.
w.p.m and speed in English typing 40 w.p.m and Computer literacy in MS Office word, excel and power point packages. 27 Years. 08.
speed in typing 40 w.p.m and Computer literacy in MS Office word, excel and power point packages. 27 Years. 04. Junior Assistant (General) Candidate Must Have Passed Graduation With Knowledge of Computers. 27 Years. 10. Total No of Post 70. 6.Online Application Can be Submitted on or Before 06th August 2018. Q. What is the Last Date For NCDC Director Post Vacancy ? A. 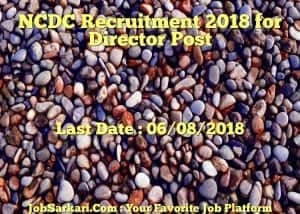 Last Date for NCDC Director Post Posts is 06/08/2018. Q. What is the Form Type of NCDC Director Post Recruitment ? A. The Form Type for NCDC Director Post Posts is Online. Q. How many vacancies are available in National Cooperative Development Corporation Director Post Posts ? A. There are about 70 Vacancies in National Cooperative Development Corporation Director Post Posts. Q. What is the Full Form of NCDC ? A. Full Form of NCDC is National Cooperative Development Corporation .